Hello, hello and happy Thursday! I know you haven't been seeing as much creativity from me as usual but I wanted to let you know I am absolutely working on fun stuff! It's just that it's fun stuff for On Stage in a few weeks and I am not allowed to share it until after the event. Don't worry, time flies and you'll get to see the fun new products before you even realize it. 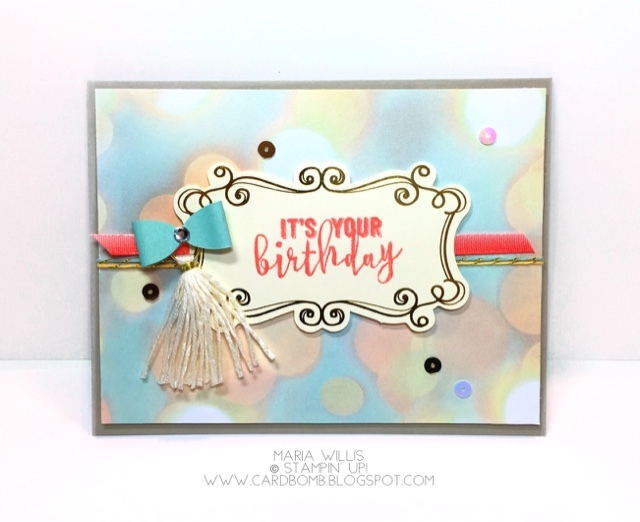 For today, have you checked out the Cupcakes & Carousels Embellishment Kit?! It's so amazing! I rarely buy embellishment kits because I'm always afraid that I won't use up the whole kit. This kit is just too fun to pass up. 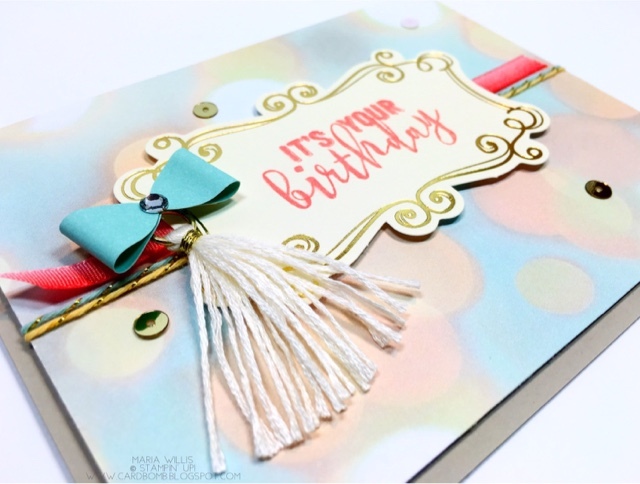 It's got two colors of twine, ribbon, paper bows, tassels, gold embellished die cuts and sequins! I used one of everything to make this simple card. I've even got a tutorial for you. Just scroll on down. Attach one length each of the blue and yellow twine around the middle of the DSP piece. Attach a length of the Calypso Coral ribbon above the twine and snip the ends on a diagonal. Stamp the sentiment in Calypso Coral onto one of the die cut pieces. Then attach it to the center of the card using dimensionals. Add a rhinestone to the center of a bow. Then use a glue dot to adhere the bow to the ring of a tassel. Use a dimensional (cut in half so it is easily hidden) to attach the bow to the left of the sentiment piece. Use glue dots to add sequins to the front of your card. Attach the embellished DSP piece to the card base using dimensionals. Have fun giving it a go! If you have any questions or need help ordering the products please let me know. Remember that through March 31st for every $50 CSV order, you will get to pick an exclusive gift of your choice from the Sale-a-Bration catalog! Pretty awesome! Also, if you love this embellishment kit, time is running out to purchase it as it will only be available through April. Need more stamps now? Never fear! I've got you covered! Thanks for stopping my blog today! See you soon!